Yesterday marked three months since the murder of Maltese journalist Daphne Caruana Galizia. 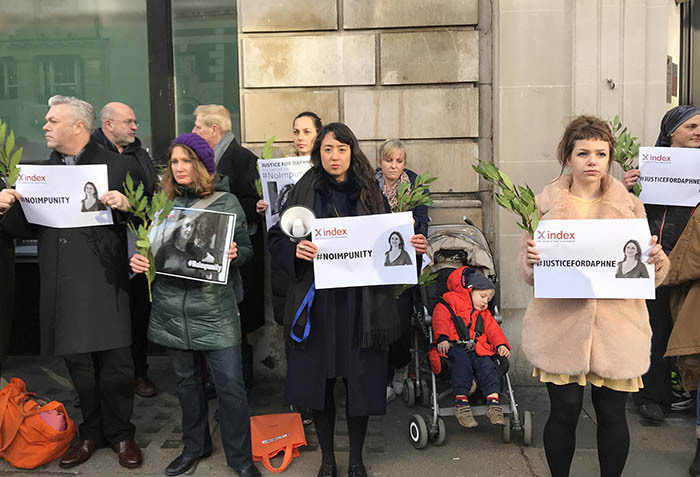 Gathering outside the Maltese embassy in Malta House, London, members from Index on Censorship stood with seven other free speech and criminal justice organisations to mark the anniversary and call on the Maltese government to ensure justice is served. I spoke with Hannah Machlin, project manager for Index on Censorship’s Mapping Media Freedom platform, Cat Lucas, programme manager for English Pen’s Writers at Risk programme, and Rebecca Vincent, UK bureau director for Reporters Without Borders for this special podcast. During the vigil, participants left bay leaves — which in Greek mythology are a sign of bravery and strength — outside the embassy in a sign of solidarity with supporters in Malta, while a statement from Caruana Galizia’s family was read out. Caruana Galizia was killed on 16 October 2017 when a bomb placed under her car exploded as she was leaving her home in Bidnija, Malta. Sixteen days prior to the fatal attack, Caruana Galizia filed a police report saying she was being threatened. Through her investigative journalism career, Caruana Galizia exposed corrupt politicians and other officials, uncovering a number of corruption scandals in the Panama Papers. Caruana Galizia also investigated links between Maltese Prime Minister Joseph Muscat to secret offshore bank accounts, to allegedly hide payments from Azerbaijan’s ruling family. Her work on government corruption also led to early elections in Malta in June 2017. At the time of her death, Caruana Galizia was subject to several libel suits and counts of harassment. Her assets were frozen in February 2017 following a request filed by Economic Minister Chris Cardona and his EU presidency policy officer Joseph Gerada. Her murder was condemned by many from the international community, with a previous vigil held on the International Day to End Impunity for Crimes Against Journalists, where nearly 60 free expression advocates gathered, calling for justice and an open and transparent investigation into her death. Malta is currently ranked 47th out of 180 countries in Reporters Without Borders’ 2017 World Press Freedom Index, and 47th out of 176 countries in Transparency International’s Corruption Perception Index 2016. Seven reports of violations of press freedom were verified in Malta in 2017, according to Index on Censorship’s Mapping Media Freedom project. Five of those are linked to Caruana Galizia and her family.